LeadAdvisors.net builds and hosts premium websites for businesses, associations, government, and Fortune 500 companies. Although there is no exact formula to making a perfect landing page, there are some common rules of thumb to increase your chances of making a winning one. Your landing page web design has to convey your message well. But, the truth is that most landing pages don’t increase conversions, which is why most people complain about low conversion rates. Lead Advisors' landing pages follow all the rules and convert at well over industry trends based on customer data. 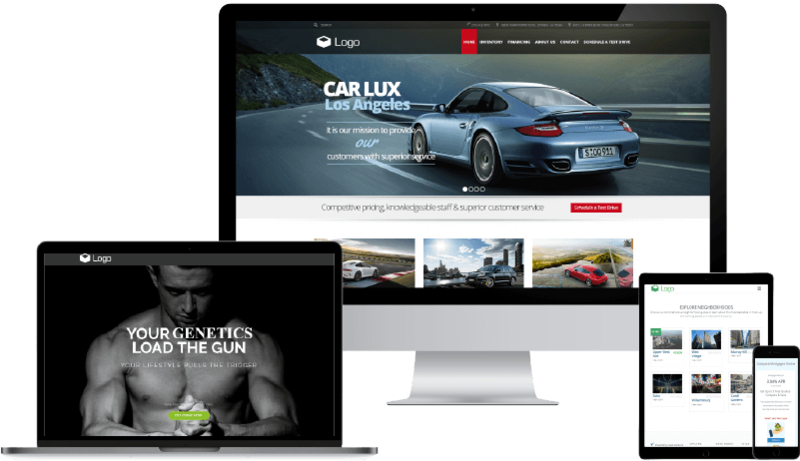 Our websites are complete solutions, offering superior value and ROI. Our web development services cover everything – planning, design, copywriting, action funnel, search engine optimization, page buildout and web hosting. Our clients take comfort in knowing that we drive the process and alleviate the pains of a typical Web development initiative..
Because it’s such a critical part of your brand, it’s important to know that you own your website – not us. We charge no licensing fees or hidden costs. We provide plenty of real-time training to ensure you are comfortable within your website's backend. Whether your business is large or small, you can no longer survive the current climate without a company website. We design and develop strong websites that meet our clients’ needs for both desktop and mobile applications with responsive design for optimal viewing on all modern devices. We start with diving into your business to come up with the most rewarding ecommerce strategy. With a customer pool being specific for each online store, we strengthen ecommerce projects with deep UX research and UX design to set the pace to further development. Creating online stores first and foremost for people, we ensure compelling, user- and mobile-friendly web design. We consult on existing options and guide you through their specifics to provide expert assistance in choosing the most suitable ecommerce platform. Then, we guarantee a smooth migration of your online store to ensure its consistent evolution. We expand the functionality of ecommerce platforms to meet your specific business needs. We provide 24/7 ecommerce support to guarantee that your online store functions smoothly and visitors don’t stumble upon any obstacles while navigating it. Our ecommerce solutions cover product and customer life cycles in your online store. Guarantee smooth navigation and effective search throughout the online store. Display products in different categories and variations. Create complex product types to enhance customer experience and boost sales. Use SEO-friendly product reviews, engaging images and videos to give customers a real feeling of the product. Develop targeted promotional campaigns for each product category by adding smart product parameters and discounts. Integrate an ecommerce website with the inventory management system to monitor product availability. Content personalization based on retail analytics. Automated upselling and cross-selling systems that are coherent with your online store design. Loyalty programs to boost repeat sales. Expanded online store functionality including multiple payment gateways, multilingual support, customer accounts and wish list. Using big data and visual reporting, we turn raw figures, such as the number of ecommerce website visits, product reviews or product purchases, into strategic insights. We create custom dashboards with segmented data reflecting behavioral aspects of different user types (new and returning, for example). Visual reports are exportable and easy to share. We ensure your customers can choose from a set of options while making an online payment. By offering a choice, we eliminate the possibility of losing a customer who hasn’t found on an ecommerce website a payment option he or she is comfortable with. optimized website by integrating plug-ins help your website load faster on all devices. we will purchase up to 2 adobe stock images to ensure your graphic, images are all yours, and not copied from online resources which is illegal. contact us, or Leadgen form with specific fields related to your product / services (up to 2 custom fields). we will setup email trigger for you to receive your online inquiries via email or integrated to your CRM(depending to your package integration availability). * Websites sold in conjunction with our social media branding may take up to 4 weeks for our team to complete. 2. Where does the content come from? 3. How to make changes to the site? 4. What is monthly maintenance fee?